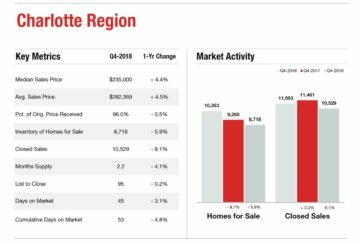 4th quarter 2018 Charlotte, North Carolina region’s home sales continued the trends we’ve seen since 2015. Home buyers are finding the housing market very competitive with higher home prices and a lack of properties to buy. Buyers looking for a bargain are “hard pressed” to find one. Meantime, home sellers continue to sell their homes relatively quickly and for top dollar, when priced right for condition and location. With regional months supply of homes at 2.2 months, the Charlotte region remains very much a seller’s market.